Even though Blogger platform offers a lifetime domain by default (for example yourblog.blogspot.com). But Blogger also allows you to easily integrate any custom domain name of your choice. A Domain Name is your unique identity in the internet world that is understood by web servers and online organizations and provides all pertinent destination information. A Domain Name has mainly two different parts which separated by a ‘dot’. For example wonderkrish.com, here wonderkrish.com is the domain name of my blog. Domain names were created to make more human-friendly than IP or Internet Protocol addresses and it can be used to identify a single or groups of IP addresses. An IP address is a unique set of numbers that is assigned to every computer on the internet. Like 192.168.1.2. But IP addresses don’t exactly roll off our tongue, and just imagine having to memorize such a string of seemingly random numbers for every single website you wanted to find on the internet. Suppose if you want to find wonderkrish.com you might have to remember the IP address of wonderkrish.com as 192.168.1.1 or something similar to that. But computers require IP addresses to locate one another, but as human, we cannot remember each IP addresses for each website. So, the IP address in the domain name’s background is converted to a recognizable, alphanumeric domain name by a system known as the domain name system (DNS). So, the Domain Names System or the DNS takes domain names. It is a kind of web address that people understands, like wonderkrish.com and translates them into IP addresses that computers need to communicate. So, instead of having to remember the numeric IP addresses for each website, we can simply remember wonderkrish.com and it’s much easier also. Right? When your visitors enter your domain name into a web browser, the browser uses your domain name to find the correct IP address and it passes back the website associated with that particular IP address and is used as part of your URL to identify your website. No matter what the other benefits, having your own domain name is just cool. Isn’t it? Assume your name is Michael and when you purchase a domain name michael.com, everybody in the world is going to know how to find you online. It gives you a distinction and almost a kind of power that everybody on the internet can find you by searching your domain name i.e. michael.com. No matter what your name is, there are probably hundreds if not thousands of other people who share the same name. Yet no other Michael on earth is going to own that domain name. It’s like being the sole and rightful owner of the online version of yourself. Once you own your own domain you can do anything you want on it. If you are a business owner, you can use it to host your online store or share critical information with your global customers. If you are an individual, you can create the digital home base that you can use to communicate with your friends, family, acquaintances, etc. Or, if you are a blogger like me, then you can write and share articles and impart knowledge to others. There are many domain providers in the market. But, today I would like to show you how to set up a custom domain in your Blogger blog with GoDaddy. By following this pictorial guide on how to set up a custom domain with GoDaddy for your Blogger blog, you will be done within no time. Step 1. Login to your Blogger blog and select Settings and click on Basic and click on Setup a 3rd part URL for your blog. Step 2. Provide the custom domain name that you have purchased from GoDaddy and click on Save. When clicking on Save you would get an error message as shown in below screenshot. So now, you have to log in to your GoDaddy account. But keep in mind that the values which I have marked in red on the above image and that would be needed to when setting the GoDaddy settings. Step 3. When you logged in to your GoDaddy account, click on your Account which is on the top right corner of your screen and select Manage Domains. Step 4. Click on the domain name that you have purchased and on the next page, select on DNS Zone File. Step 5. 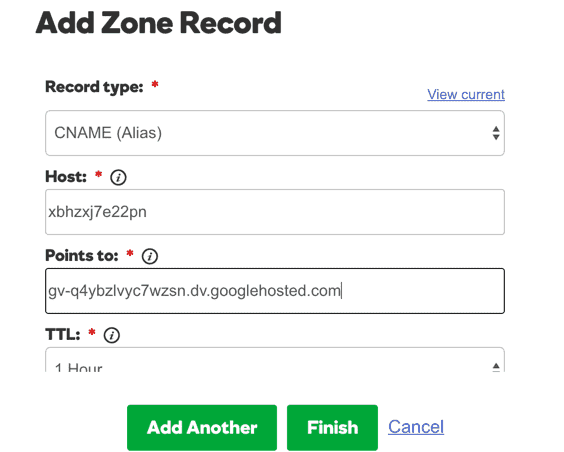 Click on Add Record (See below screenshot) and a pop-up window will appear as Add Zone Record. Set TTL to 1 Hour. Step 6. Click on Add Another and copy the second CNAME record form your Blogger page. And click on Finish and you will be directed to another page and you need to click on Save Changes in order to save your settings. 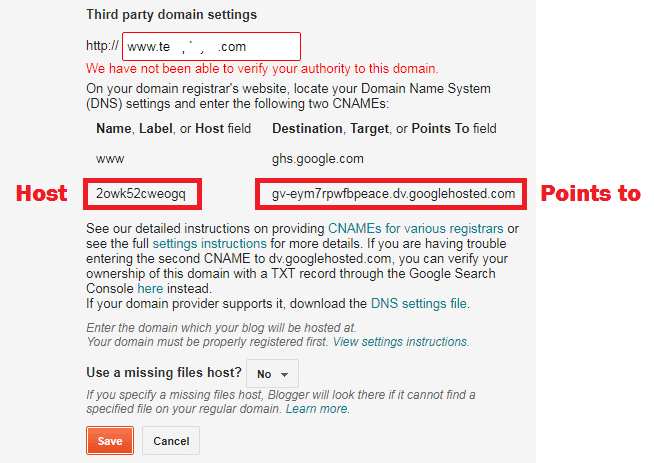 Now, the last part for setting custom domain on Blogger. In this part, you have to add 4 IP addresses into your ‘A’ record. The process of adding the IP addresses will be the same as above by following the same steps from Step 4 to Step 6. 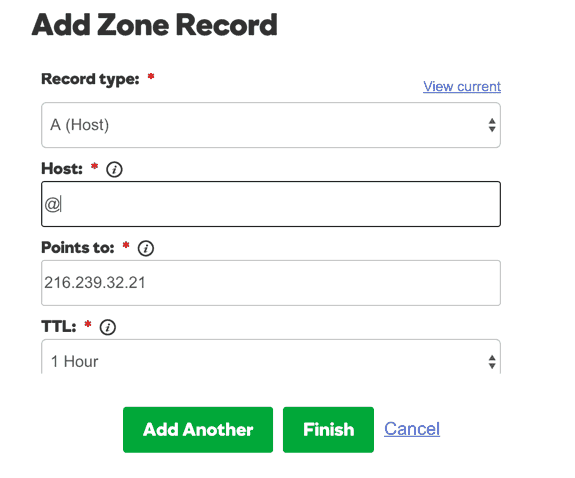 Click on Add Another when you finished adding the first IP and in this way you have to fill a total of 4 ‘A’ records. Below are the 4 IP addresses which you need to add for 4 A record. And your final A record would look like below screenshot. 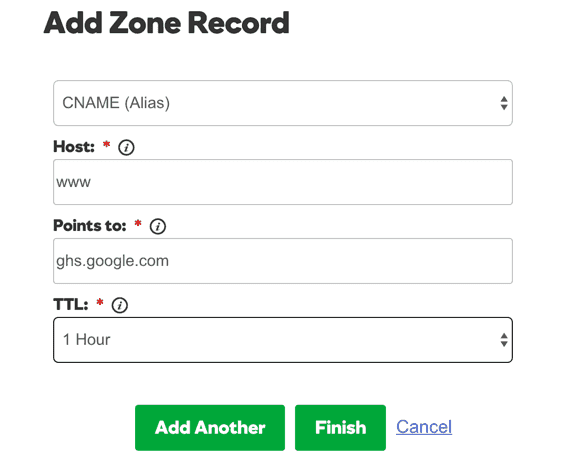 After completing setting up the CNAME and ‘A’ record, you have to wait for at least 5 minutes or may be up to 4 hours in order to get the changes reflected worldwide. So till here, you have successfully completed with GoDaddy settings and have to head back to your Blogger account in order to configure the same. Step 5. Now login to your Blogger and click on Save Changes. If your CNAME and ‘A’ record have not been reflected and updated globally, you will get an error message and that means, you have to wait for some more hours to get updated. But it does not show any error message, then your custom domain will start working and it would look like the below image. Once your custom domain is added, leave everything to Google. As Google will re-direct from .blogspot.com to your new custom domain name. And this would also be the same with your internal pages as well. Now finally you have to click on Edit here and redirect non-www version of your domain to www by simply clicking on Edit and check the option which says Redirect example.com to www.example.com and you are done setting up your custom domain for your Blogger blog. Setting up a custom domain for your Blogger blog would not only make your blog look professional but would also encourage and create trusts among other bloggers, which would help you in getting backlinks, etc. It is also advisable to contact GoDaddy customer support executive if you find difficulty during setting up your custom domain and they would guide you throughout setup process not only through text messages but would also make a call to you if needed.